A video from Lanzhou shows the moment a sidewalk collapsed. Shocking footage from China has captured the moment a sidewalk gave way in the city of Lanzhou, swallowing one woman. CCTV footage shows the exact moment a sidewalk collapsed as a woman was walking on it, swallowing her. 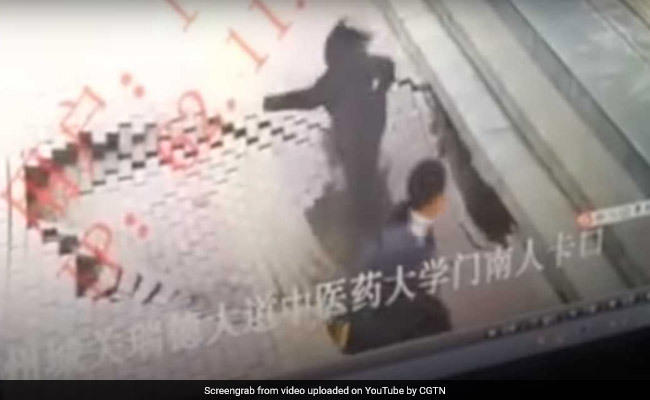 The clip, which has gone viral on Chinese social media, shows the woman hitting her head on the collapsing pavement as she falls down. Thankfully, according to Shanghaiist, the unnamed woman did not sustain any major injuries in the incident, which took place on November 11. Shanghaiist reports that the woman was immediately helped by passersby and local police officers. She was then taken to a hospital in an ambulance. The video has been viewed thousands of times on different social media platforms, and has elicited both horror at the incident and praise for the cops who rescued the victim. "I hope she'll be ok," writes one person in the comments section on YouTube. "Thank you police," says another. Police are now investigating what caused the sinkhole to form. Recently, in a similar incident in Turkey, a sidewalk collapsed and swallowed two women, who also managed to escape with just minor injuries.